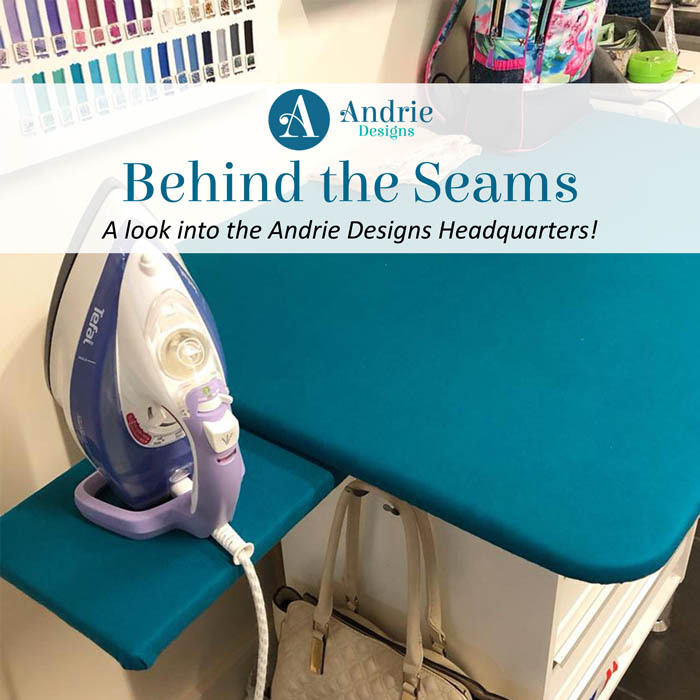 Ready for a little glimpse into the sewing space that is Andrie Designs? Well you are in luck! 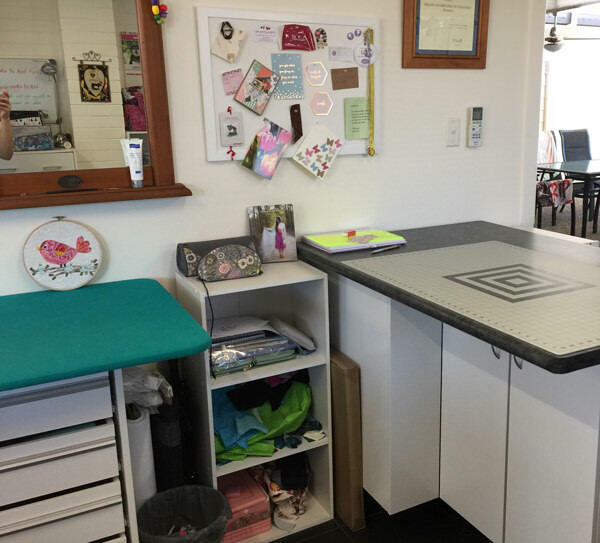 We are recapping some of Lisa’s earlier photos so you can get a peak into what the Andrie Designs sewing room and storage looks like! In case you missed them, you can see the full Behind the Seams posts here: My Workspace, My Fabric Stash, and My Storage. 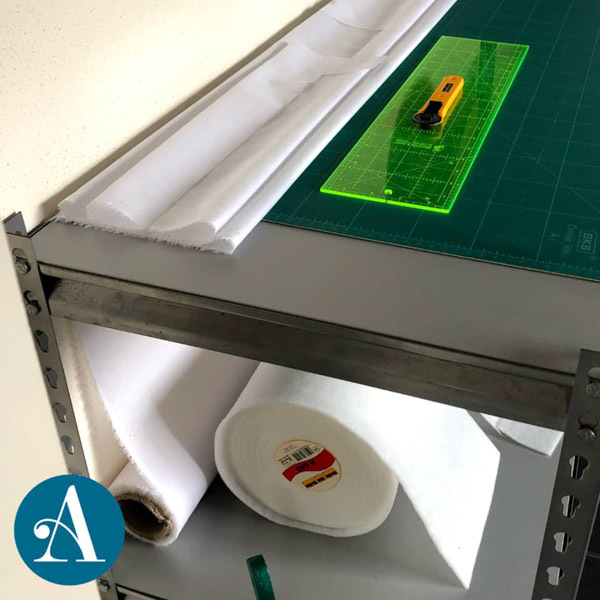 First, let’s take a look at where all the cutting happens! 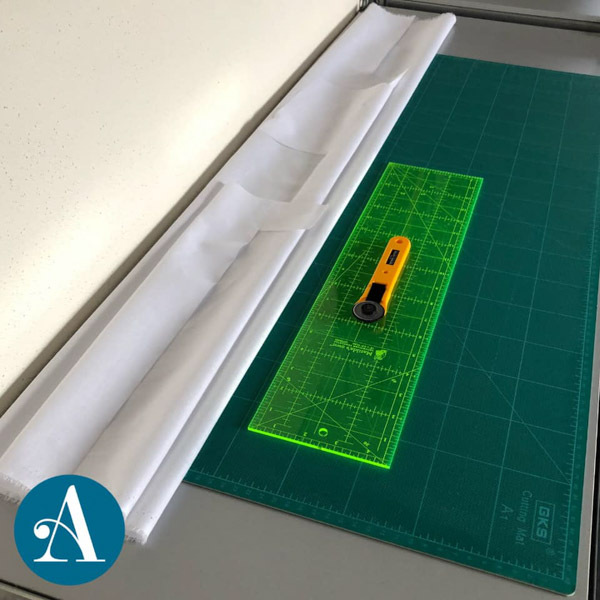 Lisa has her cutting station set up right next to her pressing table so she can cut and press that fabric right away! How smart! 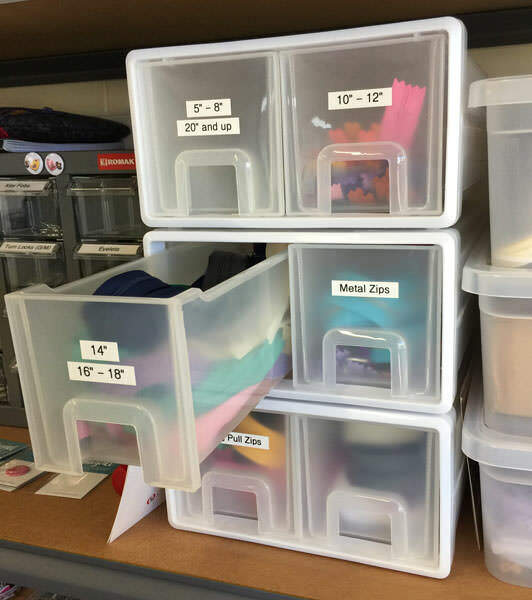 She recently added one upgrade to her space by adding a cutting and storage spot just for interfacing! A smart move because that stuff takes up so much space AND usually leaves little bits of fuzz behind! Now where the true magic happens, sewing! Her two Bernina’s are set up side by side– a B350 she saved up for and purchased herself, and an 1120 which her darling mum gifted to her (and what she learnt to sew on ‘back in the day’!). 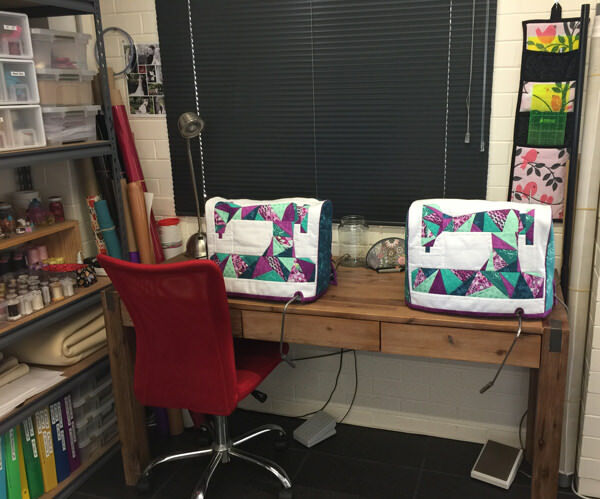 Machine covers made using Made for Me Sewing Machine Cover Pattern! 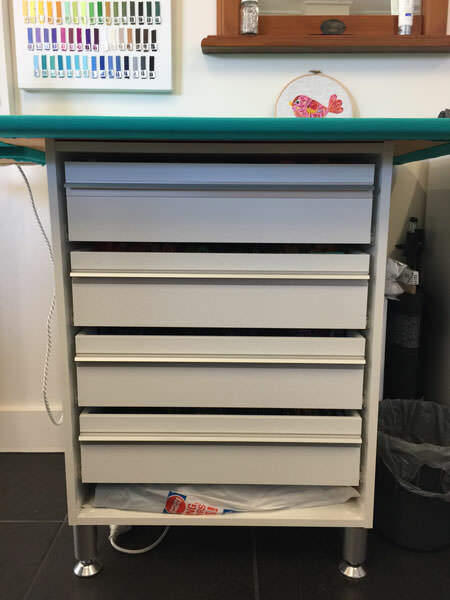 Underneath that glorious pressing table is fabric storage! We took a peek at this last week but you need to see it even more! Look how pretty the fabric looks in those drawers! Now take a look at this storage for hardware! I have so much love for this as I am sure you do! Everything is perfectly organized inside! If you want tips for using all this hardware, check out the Hardware Heaven Series! A personal fave of mine is Lisa’s zipper storage! 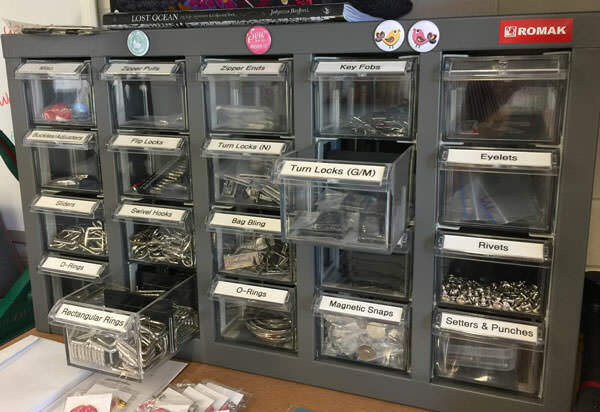 I am quite zip obsessed so I quite enjoy seeing all these labelled drawers of zips! 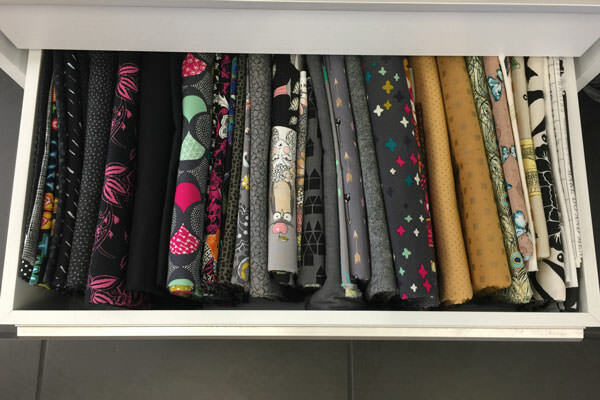 If you want to see even more pictures and storage at the Andrie Designs Headquarters, make sure you check these posts out for more: My Workspace, My Fabric Stash, and My Storage. Do you have a favourite part of Lisa’s storage or space? I love getting a look inside others sewing spaces! This entry was posted in Behind the Seams and tagged andrie designs, andrie designs patterns, blog post, fabric organisation, fabric organization, fabric storage, handbag hardware, hardware heaven, made for me sewing machine cover, organisation, organization, storage, storage solutions, zippers.